Depth of field is a subject that we talk about rather a lot on our workshops, so I thought it would be worth having a look at it specifically with reference to camera sensor format, particularly as we are seeing an increasing number of workshop participants with compact system cameras with smaller sensor formats such as four-thirds systems like the Olympus OM-D and Panasonic LUMIX G series. First, a quick recap – Depth of field refers to the space in front of and behind the point of focus of your camera within which objects appear sharp. A number of things control how large this space is – the main one being the aperture setting of the lens, but the focal length comes into play and the focus distance also. A small aperture (e.g. f22) will give a large depth of field with objects from front to back in focus. 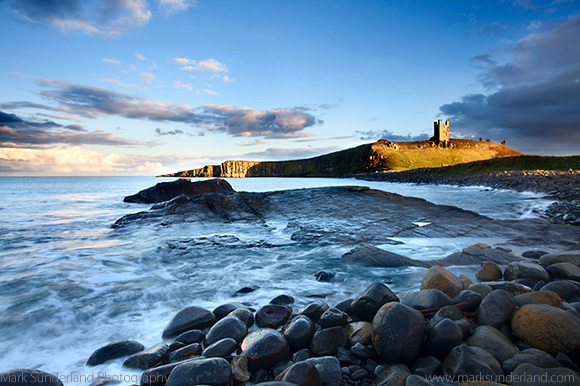 This is even more the case with a wide focal length – so the Dunstanburgh image (top) shot at f22 with a 20mm focal length should be acceptably sharp from less than half a metre away to infinity. 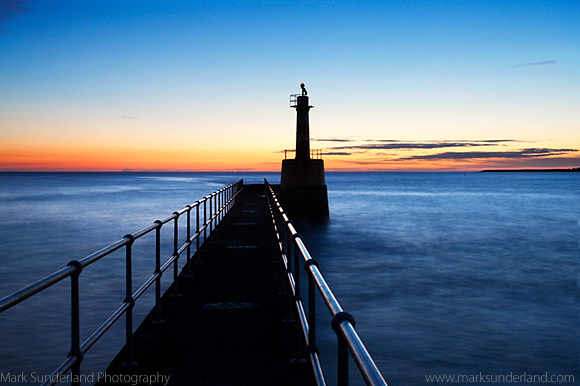 Similarly the Amble Pier image above, focused just a shade closer to ensure the railings are sharp in the foreground with the lens at 40mm. 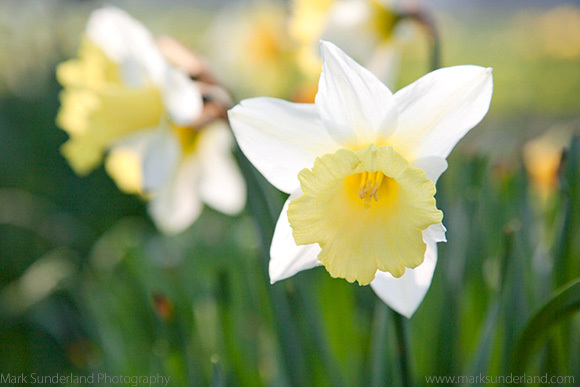 At the other end of the scale, the daffodil image below shot with a 105mm focal length at f5.6 has a nice shallow depth of field so the background is out of focus. It’s worth pointing out here that all the images above were shot with full frame cameras (mainly a Canon EOS 5D MkII) and we generally think of apertures around f22 or f16 for large depth of field and f5.6 or f4 being fine for shallow depth of field. However, with a four-thirds camera you’ll be struggling to achieve a shallow depth of field at f5.6 and (most importantly) you don’t need to stop the lens right down to achieve a very large depth of field. This is because the circle of confusion on which depth of field calculations are based can be taken (for our purposes at least) as a function of the diagonal of the image sensor, and the smaller the diagonal the larger the depth of field. If you’re into optics, there’s a detailed article on circle of confusion on Wikipedia. To illustrate this, I’m going to compare the hyperfocal distance at f22 for various focal lengths on a full-frame camera with two smaller formats – APS-C and Four Thirds. The hyperfocal distance is the focus distance that provides the maximum depth of field for any given aperture setting, with objects from half the hyperfocal distance to infinity being in focus. For example, the hyperfocal distance of a 50mm lens set at f16 on a full-frame camera is 5.2m, so by focusing at this distance everything more than 2.6m away will be in focus. Note: The two right hand columns show the nearest whole stop hyperfocal distance and the aperture setting required to achieve this on the smaller format. The figure in brackets is the equivalent focal length on that format. This is great news for four-thirds system users, as we can get large depth of field by using f11 or f8 which should also make the best use of the quality of the lens. 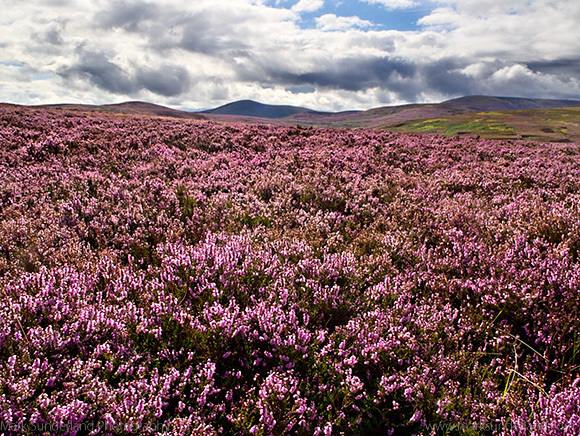 I shot the heather image below with an OM-D with a zoom lens at 14mm set at f16, so the equivalent of f32 with a 28mm lens on a full-frame camera, giving a depth of field from 0.4m away to infinity – I probably went a bit over the top there! In the examples I’ve used the Nikon DX size for APS-C (23.5×15.6mm) which appears to be the most common – other APS-C cameras vary a bit from around 22.3×14.9mm to 23.7×15.6mm but that’s not going to have significant impact on your depth of field choices. The four-thirds sensor size is 17.3×13.0mm compared with full frame at 36x24mm (or thereabouts).